I am often asked if it is worth buying a separate player if you already have a "music" phone. The answer cannot be straightforward, because some buy a separate device for extra battery capacity, while others prefer to boost the features of a budget phone by using a player as a communicator. Theoretically speaking you only have to compare specs and make your choice. In terms of playback quality many reckon that a dedicated player will always beat sound chips of a phone. Many legends exist about Cowon products. They are claimed to have the most powerful amplifiers, the "clearest" sound and unrivalled overall performance. Far from being the arbiter of last resort I offer you my comparison of sound reproduction systems of Cowon S9 and iPhone 4. I think the same conclusions should apply to iPod Touch as the hardware of 4th generation Touch is unlikely to differ much from that of iPhone. Initial conditions are the following. Firmware versions: 4.1. in iPhone and 2.52 in Cowon S9 with the disabled equalizer. Music material was represented by Prime Test CD1. Headphones used for testing belong to various price segments and offer amplifier load of unequal complexity. This way we hope to get some representativeness out of our tests. I will concentrate on sound difference between two devices with the overall conclusion at the end. 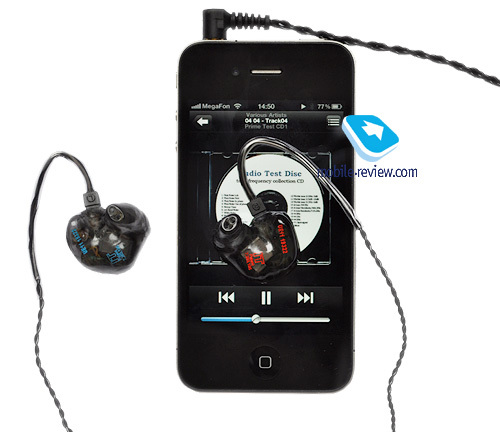 These are entry level earbuds, which are often purchased to replace old headphones from the box. When you quickly move headphones from iPhone to S9 you can notice a slight difference in low frequencies. iPhone offers more, whereas S9 has wider stereo pan. If you make pauses during comparisons the difference will level off and it is of no real importance. The sound of both the player and the phone is almost identical when you use inexpensive Fischer Audio Lambda. Here comes the iconic model and if you have not read the review I advise to do it now. First we will compare comfort volume levels. 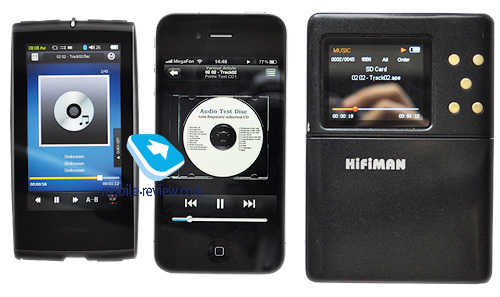 This model can be pushed enough by amplifiers of the player or the phone. In S9 comfort volume is 30 out of 40. For iPhone you get around 2/3, which means comparable parity. Cowon S9 gives more clarity and detail with a wider stereo pan, but the bass is failed in comparison with iPhone. In a head to head test you hear almost no low frequencies in S9, but the details are appropriate. If you do not like the bass of Porta Pro go for S9, but bear in mind that in noisy surroundings you may have not enough of volume, though it is a good option to take care of your hearing. Despite the high nominal sensitivity (110 dB) and average resistivity (54 Ohm) this model turned out to be too difficult to handle for iPhone 4 and Cowon S9. As we have already mentioned that both devices have equal maximum volume we only need to mention figures for S9 –35 out of 40. This volume is enough to use HD 380 PRO at home, but it is not a good solution for outdoor use. The sound quality is the same for the player and the phone, but I was not impressed on both occasions. The review of the model clearly indicates that you do not get value for money, but you can use Custom 2 for comparative tests. Low Ohm load and two driver construction are not easy to handle for an amplifier. 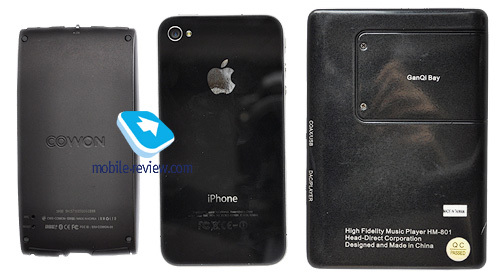 Apple iPhone 4 and Cowon S9 deal with the headphones differently. Cowon did not perform well: the sound is more blurred and less detailed, though at low frequencies S9 sounds clearer, but the stereo pan is narrower than that of iPhone. Comfort volume levels are comparable with a bit of petrol left in the tank. In this case I have to confess that a Cowon player outperformed iPhone, but it still could not improve the overall negative impression from the headphones. I have never owned more high quality earbuds than UE11PRO so I compared Cowon S9 and iPhone 4 with the headphone as well. If you do not pay attention that both the player and the phone offer inferior quality in comparison with Hifiman HM-801 it is possible to comment that Cowon S9 has a noisier amplifier, which is obvious at home, but outside the difference is unlikely to be marked. Comfort volumes are identical and provide more than enough for powerful playback. As to the sound quality with Cowon S9 it is more "empty" and ringing (do not confuse it with clarity), while iPhone 4 has more density at the expense of details. I would pick iPhone 4 as the least evil. All in all both Cowon S9 and Apple iPhone 4 offer a similar sound quality, which is not high, but it still meets the entry level requirements. The difference is obvious only with high quality headphones or in a head to head comparison without considerable pauses. Do not choose "heavy" models and go for earbuds. Owners of Apple iPhone 4 are advised not to look for a dedicated player, but select appropriate headphones. 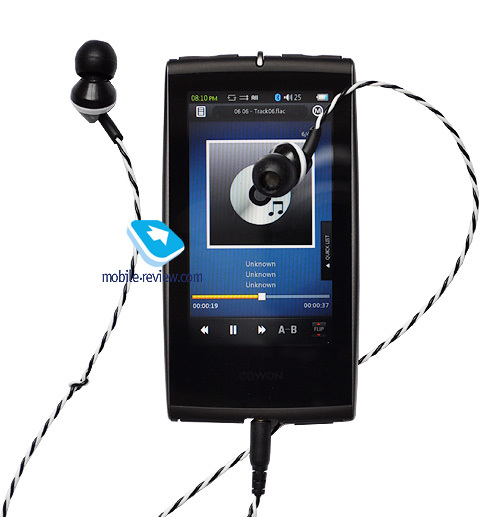 The sound quality is decent and the player features usually spare the battery. If you intend to use the portable device for video playback pay attention to S9 or a recently launched Cowon J3. A separate player makes sense if you already have an ultimate phone, which cannot play music well. I did not cover the issue of equalizers, stereo pan boosters and other enhancers, because they change the resulting sound beyond recognition without necessarily improving the quality. Prices were not analyzed too, because players and phones belong to different product groups. This article targeted only sound reproduction systems and tried to answer the question if you need a dedicated product or could be satisfied with a universal device.